Can My Tree Catch the Flu? Our program works closely with the California Oak Mortality Task Force to provide education and outreach on Phytophthora ramorum and Sudden Oak Death. We also coordinate the outreach program of the California Firewood Task Force to limit the spread of invasive forest species via firewood movement. Other forest health work assists tribes in managing pest in their forests via the Western Region Tribal IPM Work Group and other projects. We also provide natural resource education to under-served youth. See the full list of environmental education projects on our Environmental Education Resources page. 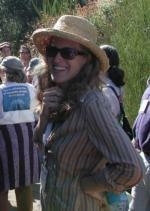 Janice Alexander coordinates and delivers education on forest health issues in Marin County, California, and beyond. She began this work in 2002 after receiving degrees (M.S. Range Management; B.A. Environmental Sciences) from UC Berkeley.